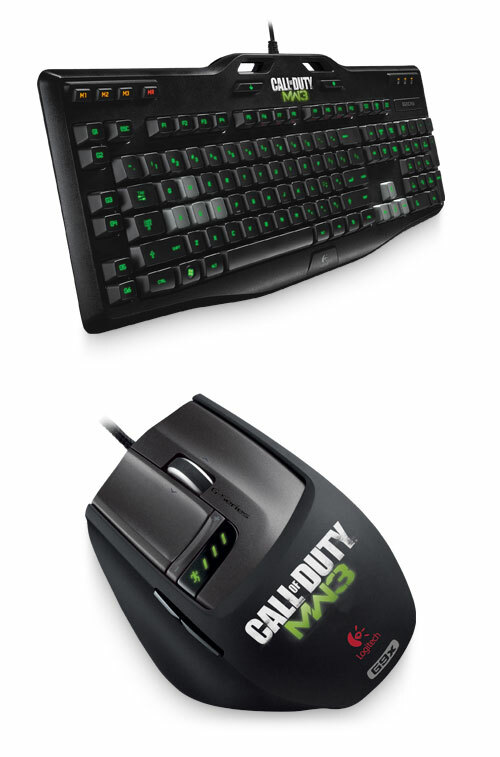 Modern Warfare 3 is just a few weeks away, but that doesn't stop Logitech from announcing their new MW3 based mouse and keyboard. These new accessories are perfect for Modern Warfare 3 enthusiasts who want the best in precision and customization for their gaming experience. The Logitech Gaming Keyboard G105 features night-vision green LED backlighting that enables you to locate the right keys even in the dark. The keyboard provides up to 18 possible macro combinations per game by using 6 programmable G-keys. Multi-key input allows you to use up to five keys at once to perform complex actions without interference or ghosting. The G105 Keyboard will be available in the USA and Europe later this month for $80. The Logitech Laser Mouse G9X has support for up to 5700 dpi sensitivity that's excellent for fast movement, but you can also lower the on-the-fly dpi sensitivity down to 200 dpi for more precise targeting. The weight-tuning system allows you to customize your mouse for more personalized feel and control. The mouse also has onboard memory that lets you program up to 5 ready-to-play profiles. The G9X mouse will be available in the USA and Europe in early November for $100. Logitech's accessories are typically compatible with the Xbox 360 and PlayStation 3, but it seems that these two are PC-exclusives. Check out the Gaming Keyboard G105 and Laser Mouse G9X below.